As in years past, the ceremony at the September 11 Memorial & Museum began at 8:46 a.m., marking the moment when American Airlines Flight 11 crashed into the north tower. It is a familiar New York ritual that is, at turns, heartbreaking and comforting. Seventeen years after 9/11, thousands gathered again in lower Manhattan Tuesday to show that the victims of the worst attack on the United States will never be forgotten and are still loved. 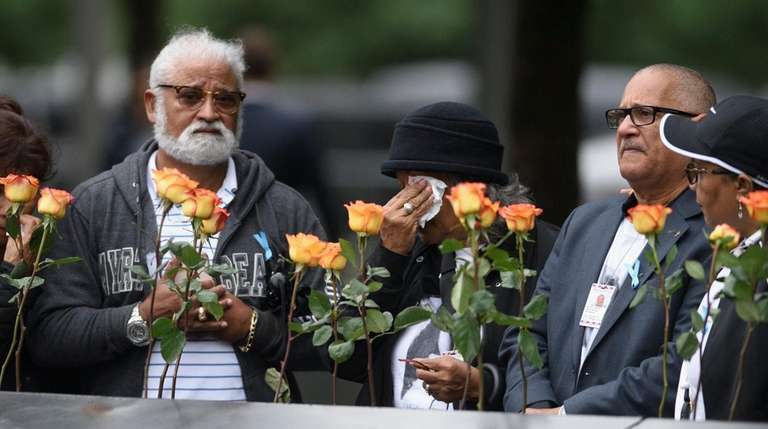 Mourners read aloud the names of 2,983 people who died, family members placed flowers on memorial plaques for the missing, and New Yorkers took stock of how the damage from that day continues. Chundera Epps used her brief time at the microphone at the Ground Zero ceremony to tell her brother Christopher about the pain of his absence over the years. "We never got to see you get married or have any kids, or something as simple as playing with an Xbox or talking on an iPhone," said Epps, of the Bronx. "Even our first black president." She talked about the importance of commemorating this national tragedy by returning to read the names year after year. "Because soldiers are still dying for our freedom," Epps said. "Because first responders are still dying and becoming ill, and people who live and work around here are still getting sick. "We can't forget. God won't let us forget." For New Yorkers, the attack on their home city and the loss of so many lives, including people they knew, continues to evoke powerful emotions. 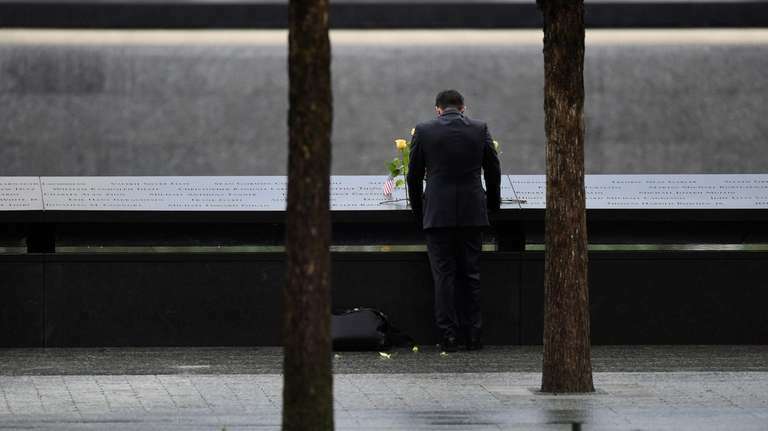 Gray skies thickened the somber mood as the ceremony began at about 8:30 a.m. at the 9/11 Memorial. Families of those who died raised photos and signs high as a bell rang out at 8:46 a.m., memorializing the moment when the first terrorist-hijacked plane struck the north tower of the Twin Towers. A stillness descended over the crowd as the procession began with the American flag carried into Ground Zero by police and fire department members in dress uniforms. The singing of the national anthem seemed a bit more mournful than usual. The crowd included numerous dignitaries, including Mayor Bill de Blasio, Gov. Andrew M. Cuomo, Rep. Peter King, and former mayors Michael Bloomberg and Rudy Giuliani. The emotional core of the 9/11 ceremony remains the hourslong reading of the names of those who perished. One by one, people read lists of names, ending with some personal words about their own loved one now gone. Husbands remembered the smiles of their wives, wives talked about the courage of their husbands, and children blessed grandparents they never met. Maria Petraglia, 52, of Howard Beach, Queens, was six months pregnant and sitting at her desk on Broad Street when the first plane torpedoed into the north tower. “When the towers collapsed everything turned dark," she said, standing where the Twin Towers stood. Port Authority Det. Frank Accardi said he had been working inside the Trade Center’s precinct and was manning the mobile communication command center. When the towers collapsed, it went pitch dark outside, so thick was the dust blowing in the air. From inside the center, he heard a sound and went to help. "We could hear the beeping of the first responders' oxygen tanks," Accardi said. "We reached for them and grabbed them and pulled them inside the command center and poured water on them from the 5-gallon water cooler jug. We were pulling cement out of their mouths." 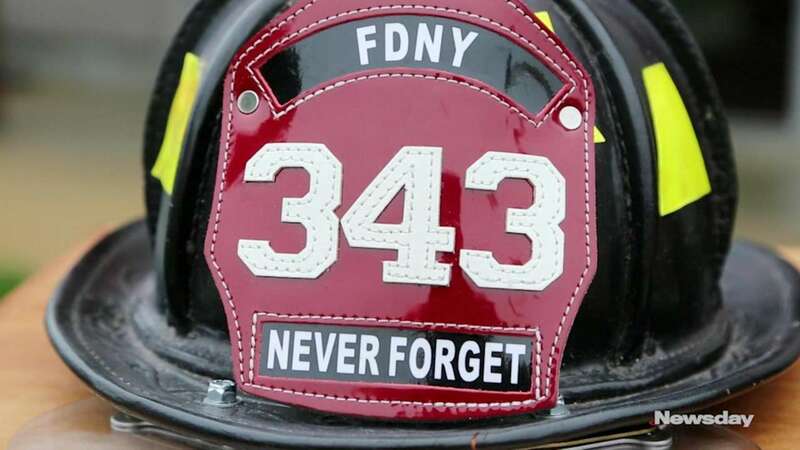 The crowd heard how FDNY Captain Gerald Chipura, whose brother John Chipura, 39, perished in the collapse of the World Trade Center, became a firefighter to honor his brother’s commitment to public service. “I followed him to help others," he said. The name-reading ceremony at Ground Zero ended with "Taps." Some people spent private moments by the plaque for their loved ones beside the memorial pool. Some placed a flower upon it. Some rested their head against it. Rubiela Arzias, 52, of Queens, said she returns every year to hear the names of those killed. She was one of hundreds of people who arrived days after the attacks to remove, sponge and wipe off the dust and debris that seeped into the windows of nearby buildings. “We are part of this story," said Arzias, who added that she now has trouble breathing, her skin breaks out in rashes and she has muscular disorders. LIers honor 9/11 victims with a day of solemn tributesSeventeen years later, the horror unleashed from terrorists has been met with silent prayer, chiming bells for when the first plane hit and tributes for the infants, now on their way to adulthood without a mom or dad's guiding hand. 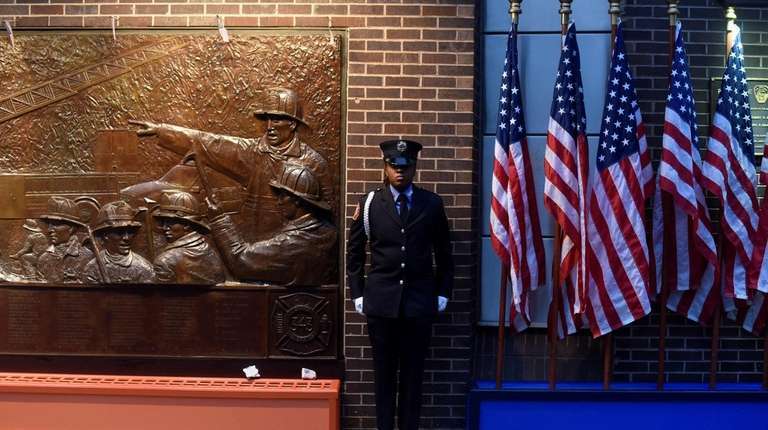 NYPD's focus on keeping 9/11 memorial events safeThe eyes of the world -- and the NYPD -- will be focused Tuesday on ... Two World Trade Center still unbuilt, uncertainEnvisioned to rise someday to 81 stories and 1,340 feet, 2 World Trade Center has been stalled by the lack of a marquee tenant necessary to convince a bank to finance its construction. LI babies born on 9/11 turn 17For families who gave birth on the day of the World Trade Center attacks, it was also a joyous personal moment and a reminder of hope.